If you travel with children, it’s always a good idea to have something for them to entertain themselves. This is the Portuguese version. It can be hard to visit monuments with little kids, so it is always a good idea to engage them in a game. If you visit Alcobaça, a beautiful abbey in the middle of Portugal, you can ask your kids to go on a treasure hunt. They can look for stones with carved initials and photograph them. This game can turn an otherwise boring visit into a memorable one. Masons often carved their personal marks on stones placed in the parts of the cathedral where they worked. They did it to show pride in their work but also to claim the work as theirs so they could get paid. 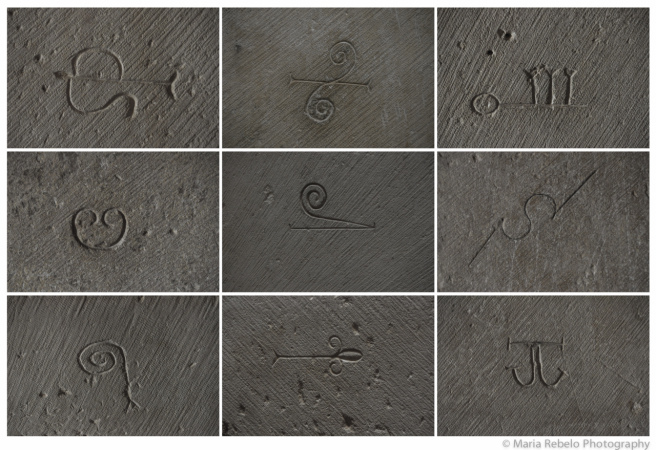 Centuries later, these signatures remind us of the humble people whose hard work created a legacy of enduring beauty. Indeed it is. I bet Terry would like it. In his own particular manner. That is super cools. I would do that so fast. There is a thought indeed!